Oncology places at La Costa - Arturo Aboal Seijas. Oncología Médica en Marbella Málaga y la Costa del Sol. A well balanced oncology sevice at the Quirón Marbella Hospital with a strong focus on patient centered, evidence based, protocol guided oncology. The service features day care unit, inpatient and outpatient care and specific units for breast cancer and intraabdominal malignancies. A young hospital place at the Palmones Marsh, the Quirón Campo de Gibraltar hospital is quickly stablishing itself as the reference in the field of oncology. In full development, the oncology service has a multidisciplinary patiente centered approach to oncology care highly beneficial for the patient. 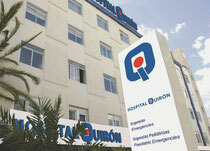 The oncology service at the Quiron Málaga Hospital is one of the main references in the oncology field in the city of Málaga. It not only delivers an excelent oncology care, but also pays special attention to other areas traditionally neglected by oncology services, such as psycology or nutrition. Marbella´s High Care International Hospital is a small multi specialty hospital with a special dedication to the oncology field. Arguably the most beautiful private hospital of the Costa, keeps a strong commintment to technology and features the only hospital based PET CT of the private sector of la Costa. 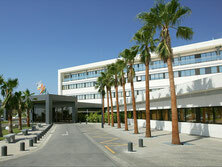 Xanit International Hospital a Vithas center located in Benalmadena provides services for Medical Oncology, Radiotherapy and Surgical Oncology through its Xanit Oncology Institute. Conveniently located close to Málaga City and its airport, the hospital pays special attention to the newly emerging sector of "health tourism". Xanit El Limonar is an outpatient clinic from Vitha´s Xanit International Hospital, formerly known as Croasa Clinic until its adquisition by Xanit. Radiotherapy and oncology day care is provided in the clinic through the Xanit Oncology Institute. 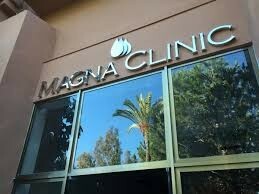 Magna Clinic is a Marbella´s multidisciplinar outpatient clinic with a strong interest in the field of oncological hyperthermia. In this field they cooperate in research with well known centers such as the Hospital Carlos Haya from Málaga and the center Clara Campal from Madrid.